THE HORRIFYING TRUE STORY OF A GOVERNMENT-AUTHORIZED CAMPAIGN OF DISINFORMATION THAT DEFINED AN ERA OF ALIEN PARANOIA AND DESTROYED ONE MAN'S LIFE. In 1978, Paul Bennewitz, an electrical physicist living in Albuquerque, New Mexico, engaged in some aggressive radio monitoring of the nearby Sandia Labs, then managed by the Department of Defense. When he became convinced that the strange lights hovering over the labs and Kirtland Air Force Base signaled the vanguard of an extraterrestrial alien invasion, he began writing TV stations, newspapers, senators -- and even President Reagan -- to alert them. For the most part Bennewitz received form-letter replies, but Air Force investigators paid him a visit, as did Bill Moore, author of the first book on the Roswell incident. 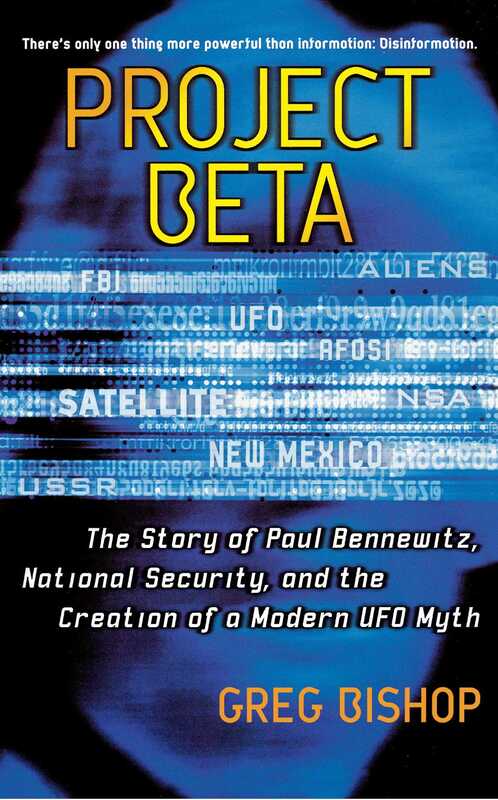 Before long Moore -- then a new force in civilian UFO research -- was tapped by a group of intelligence agents and a deal was struck: Moore was to keep tabs on Bennewitz while the Air Force ran a psychological profile and disinformation campaign on the unsuspecting physicist. In return, Air Force Intelligence would let Moore in on classified UFO material. This is Bennewitz's harrowing tale, told by fringe-culture historian Greg Bishop. It is the troubling account of the custom-made hall of smoke and mirrors that eventually drove Bennewitz to a mental institution, as well as the story of the explosive propagation of disinformation that began in 1979 and reverberates through the UFO community and pop culture to this day. Very few venture outside at night during the New Mexico winter. The bone-chilling cold repels all but the hardiest or the inexperienced visitor. It was the way of this land even before 1630, when Alvaro Nuñez Cabeza de Vaca first stumbled onto the bewildered residents of an adobe pueblo hundreds of miles beyond the northernmost outpost of the Spanish empire. Cabeza de Vaca was greeted as a miracle worker, or some sort of god. It was not the first and certainly not the last time that the "Land of Enchantment" would befuddle its inhabitants. Since World War II, this enchanted land has also been home to some of the most secret and sensitive projects that the military and its scientists have dreamed up and produced. The world's first atomic bomb was detonated here in May of 1945, and like many choice areas of stark desolation throughout the Southwest, the test area is owned by the U.S. government and is still off-limits to the public. It was in this setting that Paul Bennewitz, armed with a master's degree in physics, started a small company in 1969 to manufacture specialized temperature and humidity instruments for high-profile clients such as NASA and the U.S. Air Force. He was trying to earn his Ph.D. but his company, Thunder Scientific, became so successful that he had to devote all of his time to the business. The lab was located right on the border of Kirtland Air Force Base, which made his dealings with the military much easier. If he wanted, he could almost reach over his back wall and shake hands with a guard on base. By a strange coincidence, he could also walk across the road bordering his backyard and if there was a hole in the tall, barbed wire-topped fence, shake hands with another guard patrolling the perimeter. Whether he was at home or the office, the Air Force was always his neighbor. With a devoted wife and two sons, Paul Bennewitz looked like he had achieved the dream. There was nowhere to go but up. He had joined the Coast Guard at seventeen during WWII, started Thunder Scientific, and was an accomplished aerobatics pilot and guitarist. The demands of his business now left little time for friends and socializing, but this did not bother him. Thunder Scientific and his family were all that he needed. What little time he had left was devoted to plowing through a small collection of Wild West novels, his only guilty pleasure. But he had a secret interest that would be kindled with a series of strange events that, in retrospect, almost seemed to have picked him out, rather than the other way around. It was on a freezing, windswept night in the winter of 1979 that Bennewitz stepped out on his exposed second-story deck in the exclusive Four Hills neighborhood of Albuquerque for what was quickly becoming a nightly ritual. Ever since September, he and his wife Cindy were seeing multicolored lights floating and swooping about the small mountain range inside the base about a mile from his home. Through telephoto lenses so large that they dwarfed his cameras, Bennewitz compiled hundreds of photographs and shot thousands of feet of 8-millimeter film of these tantalizing objects. At times, the lights streaked away as quickly as a magician's sleight of hand, only to reappear seconds later, apparently miles from where they had just been. To Bennewitz, this was irrefutable proof that something unearthly was playing cat-and-mouse with the human race, daring us to react. In time, the fifty-two-year-old electronics expert would present this mass of data to the authorities, which he thought would waste no time in confronting the threat. They would have no choice. The lights were flying around the Manzano Weapons Storage Complex, then the largest underground repository of nuclear weapons components in the Western world. The Manzano Mountains rise abruptly out of the sloping plateau on which the metropolis of Albuquerque lies, honeycombed with tunnels and shafts, which were crammed to their cavernous ceilings with nuclear weapons and replacement parts for all sorts of atomic devices. It was the most secretive and highly guarded area on the sprawling grounds of Kirtland. Summer storms often zap the peaks of the Manzanos with forks of lightning even when the area around it is clear, making it appear like some sort of mad scientist's aerie. In 1939 a group of prominent Albuquerque residents suggested that the U.S. government would be welcome to use the area south of their growing town, and so the Kirtland Army Base was founded just before WWII as a training facility. Rusting, fifty-year-old tanks still stand sentinel in remote areas of the base as remnants from this period. After the war, abandoned homesteads and ranches on Kirtland's massive "south forty" were used as safe houses for German scientists "liberated" through the Office of Strategic Services' Operation Paperclip. After debriefing, they were shuttled to the White Sands missile range and the Los Alamos labs to put valuable Nazi know-how to use in the burgeoning Cold War. The remoteness of the place and the easy security it offered began to attract the notice of Pentagon intelligence types. On the southeastern slopes of the Manzanos, concrete bunkers jut out from the mountainside -- some near the bottom, others on seemingly impossible slopes farther uphill. These are the entrances to tunnels and underground rooms that are safe from all prying eyes and aircraft and spy satellites. Seen from the main road through the base, the bunkers seem isolated. The access roads are not visible -- they are cut into the hill so as to be invisible from ground level. They are likewise camouflaged from above to foil observers in high-flying aircraft and from space. Satellite pictures of the area reveal no roads or structures. Are they just "painted" out, or are they hidden in some other way? Viewed from a trail through the sage and scrub brush near the Bennewitz home, the mountains start to lose their innocent look. The 50,000-volt electric double fence that rings the entire base of the hills can be seen snaking over a distant rise. Over the years, Base Security has found a few people tangled in the fence or crumpled next to it, electrocuted to death. In some areas, visible only when the sun is at just the right place in the sky, the mountain is covered with what looks from a distance like pieces of broken plate glass mirrors littering the hillside; in all probability these are devices to foil satellite and aerial photography, and perhaps even ground-penetrating radar. Some employees of private Air Force contractors Sandia National Laboratories and Phillips Laboratories (which share Kirtland real estate), as well as various Air Force personnel, have let slip that something else is, or was, stored in this impenetrable fortress. One former scientist who wishes to keep his anonymity recently said, "Some of the guys working on the base used to talk about other things that were in there." When pressed as to what this might be, his curt answer was "Flying saucers." There is really no way of knowing whether this was just a ploy or whether there really were captured UFOs sitting in the dark, tunneled recesses of the Manzano Mountains. Welcome to the first stop in the disinformation funhouse. The area southeast of these mountains and out of sight from any civilian viewpoint is known as Coyote Canyon and is also home to some of Sandia National Laboratories' research and test areas. Sandia scientists were (and are) consistently at the cutting edge of defense research. The facility, formerly owned by AT&T, is now owned by the Martin Marietta Corporation and run by the U.S. Department of Energy. Technologies such as laser-guided missiles and electromagnetic pulse defense systems were pioneered here. Anything not under the Air Force or its contractors' strict control is regarded with immediate suspicion. The National Atomic Museum was moved off base sometime after the terrorist attacks of 2001, and large LED signs at all entrances warn visitors of the daily security alert status. The security at Kirtland wasn't always so airtight. Sometime in the mid-1980s, an unidentified man pulled up to one of the entrances and announced, "Here's my ID" as he pulled a loaded pistol from his coat. He led the Kirtland security police on a wild chase and somehow managed to escape through a remote hole in the fence somewhere on the southern perimeter, although this may have been a sophisticated training exercise. On a recent visit to the base I counted nearly as many security vehicles patrolling about as all other cars and trucks combined, and at least three or four no-nonsense, bulletproof-vested-and-armed guards at every entrance. Hidden cameras and constant patrols are designed to keep the massive fenced perimeter secure. Anything or anyone that tries to fly in would likely be blasted out of the sky by hidden surface-to-air missiles. But if Bennewitz was correct, a few stealthy UFOs may have had better luck. It would not be the first time. New Mexico has long been home to many strange objects that dart across the sky. From 1948 to 1950, under a spreading blanket of the emerging Cold War, the Air Force was alarmed by sightings of "green fireballs" that entered New Mexico airspace from extreme altitudes and streaked silently across the night sky for a few seconds, finally fading into the blackness. Most of the sightings described these phenomena traveling at great altitudes and along a generally level path, which led investigators to guess that commie saboteurs might have found a way to launch missiles (or something else) over our most sensitive installations. Some of the objects were observed over the sensitive nuclear storage areas of Kirtland Air Force Base and Los Alamos, even as expatriated German rocket scientists were test-firing captured V2s at the newly commissioned White Sands missile range some 200 miles to the south. What if these strange green "comets" were being used to test the Russians' aim? If they could already hit targets in the continental United States while we were still tinkering with keeping our rockets from crashing on liftoff, how could we defend ourselves? The Air Force inaugurated Project Twinkle to investigate these "green meteorites," but after three years of intense study, nothing was learned of their origin, composition, or purpose. Capt. Edward J. Ruppelt, director of Project Bluebook, the Air Force project investigating flying saucers, later heard that some Los Alamos scientists believed that the fireballs were something fired from outside the atmosphere by "extraterrestrial spacecraft." Los Alamos scientists were not on any government panels dealing with unexplained aerial phenomena, and it's not hard to see why. Northern New Mexico was such a hotspot for UFO sightings in the early 1950s that the Air Force floated a proposal to set up "saucer spotting stations" across the countryside, outfitted with trained observers and sophisticated photographic equipment. The idea never made it past the suggestion stage. The age of paranoia would soon be giving way to the Age of Aquarius, but the people whose job it was to stay paranoid began to look on this UFO thing as something that could be useful, not the constant public-relations headache it had been. Instead of trying to explain things away, official (and secret) policy at the CIA in the early 1950s dictated that flying saucers could be used as a cover for very terrestrial projects, such as the U2 spy plane. The Air Force cooperated and helped to drive attention away from actual sightings of experimental or classified aircraft. Since the CIA and USAF had spent so much time and effort ridiculing and downplaying the phenomenon, most educated people and those who prided themselves on a no-nonsense outlook now considered UFOs the products of delusions, hoaxes, and misidentifications. Anything unfamiliar in the sky (and maybe even on the ground) could be used to cover a multitude of shenanigans. The Air Force eventually realized that this could be taken a step further, and twenty years later, the perfect opportunity for this scenario would present itself, unsurprisingly enough in New Mexico. Saucer-spotting stations and green fireballs were decades in the past when Bennewitz began to notice animated lights darting around the wilds of Kirtland Air Force Base, which covers almost as much real estate as the entire city. In time, he would become both annoyance and salvation to the Air Force Office of Special Investigations (AFOSI), the CIA, the National Security Agency, and the Defense Intelligence Agency. A whole pack of weirdness would become legendary in the history of UFO lore, and spawn a generation of stories and rumors that were believed as gospel, first by UFO researchers, then by the choir to whom they preached, and finally by consumers of TV, film, and late-night radio as the stories became part of the popular culture: Aliens have underground bases in the desert. Aliens are in cahoots with our government to exchange technology for abduction rights. Aliens are farming human body parts for supper. Aliens created humans and sent Jesus around later to keep us in line. These stories would keep saucer fiends busy and TV producers wealthy for years. And it all started with just a few little, carefully chosen lies. Greg Bishop publishes and edits the UFO/conspiracy/psychedelic/new science journal The Excluded Middle. His reports, interviews, and features have also appeared in Fortean Times, UFO Magazine, Magical Blend, The Nose, Crash Collusion, Book Happy, and in the books Conspiracy and Cyberculture, Zen And The Art of Close Encounters, You Are Being Lied To, and Kooks. Greg has spoken publicly at numerous conferences and meetings, including an appearance as a panel member and featured speaker at the Disinfocon conference in New York City, described by the New York Times as the “Cyberpalooza of the Internet culture.” He has also appeared on many radio and Internet interview programs, including The X Zone, Strange Days, The Paul Garson Show, and The Infinity Factory. 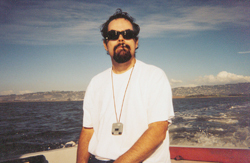 His radio show, Radio Mysterioso, can be can be heard on the Internet on Sundays at KillRadio.org. "This is both a true story and a little known but extremely important event in the social history of the fringe movements that swept America during the 1990s."